According to the UN, another 2.5 billion people could be added to urbanized cities by 2050 increasing the proportion of urban areas in the population to 68%. These growing urban populations are creating a host of issues including increased congestion. This severe city congestion will inhibit mobility and contribute to the already high rate of automobile accidents—around 1.3 million deaths worldwide—if transit companies and other organizations don’t implement a solution. Fortunately, in recent years, a solution has been growing in popularity. The solution dubbed mobility as a service (MaaS) is a movement away from personally owned vehicles towards mobility solutions provided by a combination of public and private organizations. It combines various means of transportation to deliver optimal routes as requested through real-time route scheduling software and more. These forms of transportation spread as far as one can feasibly imagine including trains, cars, buses, bikes, etc. 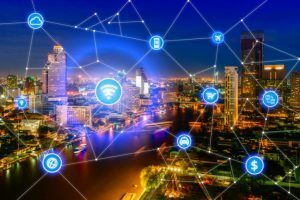 Many industry experts believe MaaS is the future and some have even referred to it as the “blockchain” of mobility. They don’t expect it to be just an alternative to our current systems, but to replace them entirely. Why? MaaS is a rider-centric model which provides its users, and the societies in which they live, with enormous benefits. Below are some of the personal and societal benefits mobility as a service creates. Cost-savings: By using pooled resources from private and public organizations in conjunction with autonomous vehicles, MaaS provides optimal transportation services at a price lower than that of owning and operating a personal vehicle. Personalized and optimized: Each route created in a MaaS model is customized and optimized for the rider’s convenience. Passengers will have the ability to pick a course based on cost-savings, the speed of arrival, and possibly by the eco-friendliness. Simplified payments: Instead of car payments, auto insurance, and individual transit tickets, MaaS will have one of several simplified payment options: recurring subscription payments, a pay as you use model like Lyft, or prepaid accounts that are deducted after each use. Healthier citizens: The MaaS model encourages physical movement. Often the quickest and most efficient route will require a bike or walking. In the interest of time, MaaS compels riders to get up and move more than they usually would by having access to a private automobile. Additionally, now that people aren’t always stuck in terrible congested traffic or searching for parking, they will have more time to spend on the things that make them happy instead of those that add stress to their lives. Convenience. Imagine a world where searching for parking, filling up gas tanks, and changing your oil are relics of the past. With MaaS, they would be. People love the convenience and often choose it over more difficult alternatives. When the convenient choice is the objectively better choice, great things happen. Reduced congestion: As urbanization rises, so too does traffic. MaaS alleviates traffic by pooling resources: vehicles, data, and software. 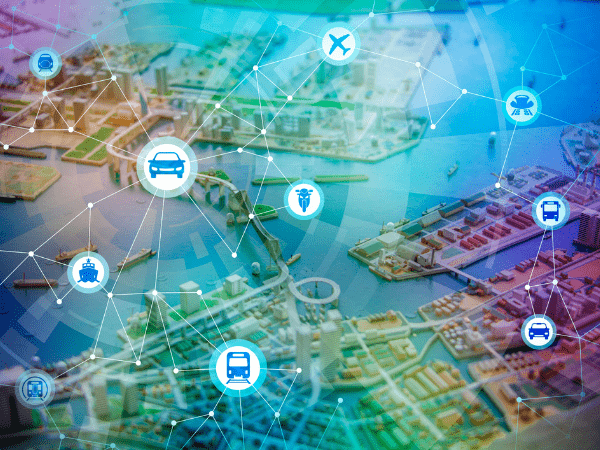 In a MaaS model, separate organizations work together to create efficient city transportation through the optimal use of their combined resources. Higher levels of safety: Public transportation currently provides a safer alternative to automobiles, and self-driving vehicles are expected to address many of the safety issues associated with human error behind the wheel. Through a combination of these services, MaaS drastically increases safety for riders and pedestrians. Sustainability: Personal vehicle use accounts for nearly one-fifth of US emissions. While the need for transportation will only increase as populations rise, efficient vehicle use will help curb the impact of transportation on the environment creating a better long-term solution. Additionally, because MaaS encourages people to walk and ride bikes, people will be less reliant on emission-producing vehicles. Mobility as a service is a scalable and sustainable business model that benefits riders and the cities in which they live. Above, we focused on the most critical and apparent benefits, but many secondary benefits will likely stem from this innovation. Ancillary businesses meant to supplement the industry and the return of wasted time spent searching for parking or stuck in traffic will add economic value. How does the MaaS Model Work? The benefits of mobility as a service are diverse and plenty; through the combined efforts of public and private organizations, we can achieve them. What do these combined efforts look like? On the front end, these organizations must build out the proper infrastructure. This process includes establishing a system for sharing and securing the appropriate data, for determining the correct utilization of resources, and for payment structure. Additionally, these organizations will need to work with governments to meet the specific needs of the city and its people. Once MaaS is implemented, these organizations will have a series of ongoing processes. These processes include iteration and troubleshooting in addition to the day-to-day operations. Daily operations resemble what these organizations are doing now, but with more inter-organizational cooperation. Behind the scenes, they are sharing the necessary data so that the software can process vehicle capacity, rider location, destination location, traffic, and any other critical data to give the rider a seamless experience. What does this seamless experience look like? A citizen requests a ride on their mobile device. A journey planner, a specialized search engine, finds the optimal route between two locations potentially using several forms of public and private transportation. It then gives the rider a series of instructions to follow and any required tickets. The rider embarks on their journey following their set of specific directions and using any required tickets (all visible on their application) until they arrive at their destination. Payment is automatically deducted from their account or added to their bill or already prepaid if using a subscription model. The MaaS model creates a seamless rider experience through a vast interconnected system of different organizations. New technology will continue to iron out wrinkles in the network making it more efficient and effective. Picture MaaS as a living, evolving organism adapting itself to the ever-changing needs to people and civilizations. Different cities will experiment differently and share knowledge so that each model is continually optimizing. Although MaaS won’t likely be in your neighborhood tomorrow, forms of it do exist and are pushing the envelope every day. For years, visionaries have depicted “smart cities”; now, these portrayals are being fleshed out and implemented. These MaaS implementations are still in their early stages with a lot of ongoing experimentation. In 2017, the MaaS industry was valued at $38.76B and is now expected to grow to $358.35B by 2025. One city pushing this global trend is Helsinki, Finland—where Sampo Hietanen resides. Helsinki currently offers a limited version of MaaS but plans to make owning a personal vehicle unnecessary by 2025. Their success thus far is validating MaaS as a viable means of sustainable and scalable transportation model. Another major factor contributing to the growth of MaaS is the rise of ride-sharing companies. These organizations are critical components in facilitating—what are often referred to as—first and last mile trips. Currently, the only door-to-door public transportation channel serving first and last mile trips are paratransit services and NEMT services. However, ride-sharing services promise to meet the demand for these trips. 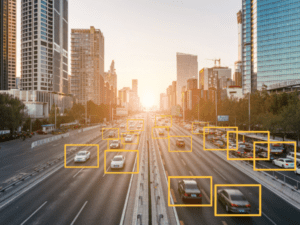 Autonomous vehicles play another significant role in the adoption of mobility as a service because the viability of the MaaS model is contingent upon its cost-effectiveness. Without cost-effectiveness, many have doubts as to the model’s wide-spread adoption, which is a requirement for the MaaS to work. Most believe the cost of MaaS needs to be below that of owning and operating a personal vehicle. Additionally, self-driving cars appeal to those interested in safer transportation options. Before mobility as a service can be realized, cities and organizations must overcome many roadblocks. These roadblocks vary in scope, importance, and in terms of who will need to address them, but as a society, we need to overcome them to effectively implement a MaaS model. MaaS requires a robust public transportation system. While many big cities offer sound public transportation systems, many do not. Certain cities have grown rapidly and unexpectedly making the implementation of public transportation infrastructure difficult. Outside of cities, rural areas face even more difficulty. Often these areas are spread out making public transportation and therefore mobility as a service a moonshot. MaaS requires open/shared data. Implementation of MaaS is contingent upon private and public organizations sharing the right data. This data-sharing network needs strategic partnerships, nation-wide discussions on data rights, and the proper oversight to see the transition. MaaS requires access to proper technology. New advancements in technology have made the MaaS model feasible, but to many, this technology is inaccessible. Individual technological inaccessibility stems from a lack of resources to afford such capital or a lack of infrastructure to run it on. Also, many transit agencies lack the proper resources to invest in the technological infrastructure to support MaaS. These individual, societal, and organizational limitations present a significant problem to the mass adoption of mobility as a service. Implementation costs are high. Both public and private organizations bear the investment costs of MaaS implementation. The costs to develop, test, and implement the technology and infrastructure are high. While individual private organizations have the resources required, many public institutions do not. A drastic change in transportation needs governance. Such a significant disruption—that MaaS promises to bring— necessitates oversight. In addition to the expected implications, there are always unintended consequences. Whether these outcomes are negative or positive, the government will undoubtedly need to discern and address them. A significant cultural shift will need to take place. Only 47% of Americans have proper access to public transportation and while ridership is increasing, a vast majority of Americans still primarily travel by car. The automobile in engrained in US culture as a symbol of ownership and freedom. Adopting a new system of transportation which discourages private vehicle ownership will be a massive paradigm shift for the United States to overcome. Lists of challenges are rarely small, especially with such monumental disruptions. While they are difficult, we, as a society, can overcome them with the right collaboration, communication, and creativity. That being said, how we envision the MaaS model now may—and likely will—evolve. Many different interpretations of the MaaS concept already exist. What is important is that we continue to develop these concepts with the needs of the riders and societies in mind. National Express Transit (NEXT) is and always has been focused on the rider. Our goal is to ensure the most effective, pleasant, and efficient trips for transit users. This goal aligns with the MaaS model and NEXT plans to be a major component in the MaaS model. As we’ve stated previously, the MaaS model relies on a series of partnerships and collaborative efforts. Additionally, transit plays a major role throughout the rider’s journey. We are positioned to fill these gaps. While National Express Transit doesn’t currently develop software, we have partnered with organizations such as Ecolane to fulfill the needs of our riders better. NEXT continues to establish strategic partnerships with technological partners. Our determinate to integrate technology with transit infrastructure will be pivotal in implementing MaaS. These technical partnerships include software, autonomous technology, and back-end infrastructure. The purpose of these partnerships is to create a system of collaboration that encourages shared data and rider-focused initiatives. In addition to software-focused partnerships, it is critical to develop partnerships with ride-sharing organizations. They have the resources to handle first and last mile trips for a majority of the population. However, they still fall short for special needs individuals. Our expertise, experience, and specialized resources in paratransit will ensure all citizens have proper access to mobility. 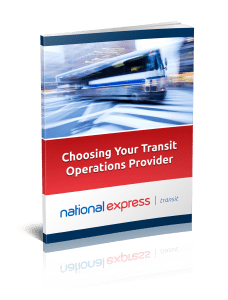 National Express Transit is committed to developing partnerships to increase operational efficiency and customer satisfaction. We understand the time and energy it takes to foster harmonious relationships, which is why we have created an eBook to make choosing the right transit operations provider frictionless. Ensure you are making the right decision and download our free eBook today!